21, Aberdeen, law student and baton twirler. 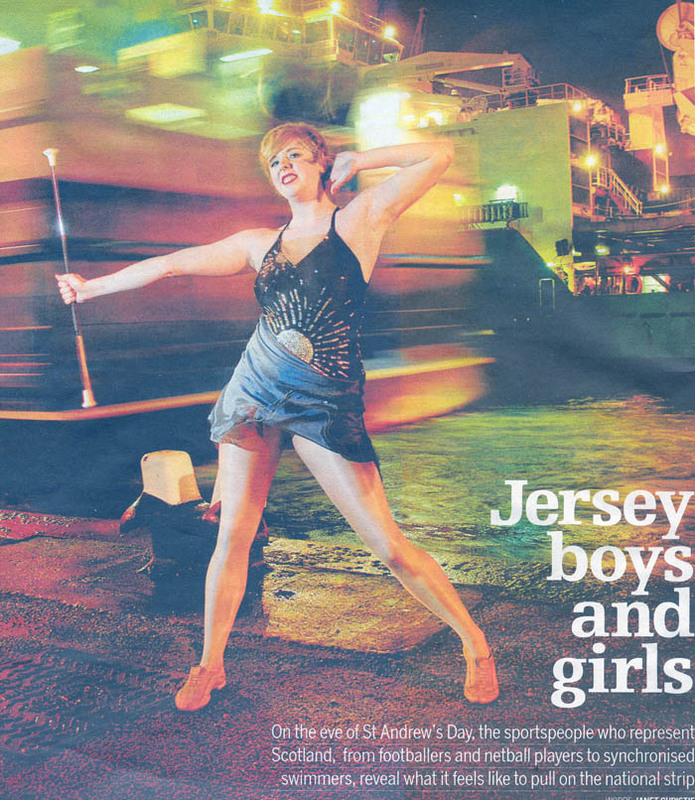 For Scotland's number one baton twirler, pulling on a Scotland strip is not about sweaty, heavy-duty cotton and joggers, as she is one national hero who gets to slip into something a little more fabulous, a little more spanglesand-spandex than padding and polyester. Petrie, from Strathmiglo in Fife, admits that the rhinestone-and-sequin leotards that go with the sport were definitely an attraction when she twirled her first baton at a church hall in Auchtermuchty at the age of three. "The outfits are like you see on Strictly Come Dancing and cost about £300 a time as they're handmade. Even the raw materials cost hundreds of pounds." As well as the aesthetically pleasing outfits, the sport's blend of dance and athletics appealed to Petrie, and she is now Scotland's number one twirler, representing the country in international competitions, as both an individual and as part of a team. "I was immediately hooked by it. It was so exciting and nobody else did it so it was my thing," says Petrie, a student at Robert Gordon University. She practises in the university gym, where the ceiling is high enough for 20m throws of the baton. On top of eight to ten hours of practice over four nights a week, she travels to Glasgow every month to compete and has achieved eighth place in the European Baton Twirling Championship as an adult, while she reached fourth place as a junior. Originally a Dutch sport, baton twirling came to Scotland from the US 50 years ago, and now there are estimated to be around 1,000 participants in the, UK. Moves are performed to music and twirlers are marked on how well the routine is choreographed to the song as well as by agility with a stainless steel baton up to 1m long. As well as practising with the baton, twirlers often do ballet to get core strength, jazz dance for rhythm and swimming to get all-round fitness. "It's still a small sport but it has really taken off because it combines so many other sports, like gymnastics or ice skating (without the ice), but is more accessible. Having a male twirler on Britain's Got Talent raised interest and made it acceptable for men to be twirlers. At the highest level, men are the best for strength, but women have the edge on grace and technique," she says. "People think it's like cheerleading and very girl-oriented, but it's not You have to have a lot of strength to throw the baton really high and do two cartwheels before it comes down. I have arms bigger than most guys, which is great for arm-wrestling, but not so great in a party dress. I take boys on all the time. " Like her fellow international competitors, Petrie gets a thrill when she's performing for her country, especially abroad. "Anyone who is at the level of representing their country can't help feeling proud. Not many people get to do that, and coming from a small sport is even better - it's exhilarating. Combining study, training and performing is exhausting but it's worth it if you get to perform for your country. The Scottish fans are really loud with air horns. Last year at the European championships they were singing Chelsea Dagger by The Fratellis and waving the flag. It was brilliant." However, along with the glory of appearing for Scotland come injuries, and Petrie has in the past dislocated both knees and broken her nose three times. 'That was with the baton hitting it. It certainly taught me to catch the baton. It's a rite of passage. In years to come, people will ask me how I got a squint nose and I'll be able to say, 'Once I was Scottish number one baton twirling champion." Petrie will be performing at the European Baton Twirling competition in Sheffield in July 2010, along with around 30 other Scots.